We’ve recently added a new video to our “How To” series to help educate office supply shoppers on how to buy office products that are a little tricky. Like our How to Buy Ring Binder video previously produced, How To Buy Classification Folders briefly goes through all you need to know to make the right purchase every time. From explaining the difference between classification folder sections and dividers to visually showing you the difference between top tab and end tab file folders, this video quickly takes the confusion out of buying one of the product categories we hear the most questions about. Filmed outside the ZumaOffice.com offices in beautiful Austin, TX, the video features music by one of our favorite Austin area musicians, Isreal Nash, (if you haven’t heard the album Rain Plans you are missing out). Check out How To Buy Classification Folders by clicking the link, or going to the “How to Video” section of the Zuma blog. 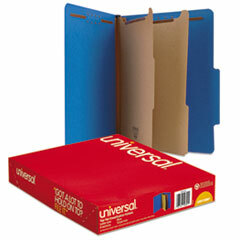 Learn the ends and outs of buying Classification Folders like this 6 section folder from Universal. If you have any office supplies, technology supplies or janitorial supplies that are confusing, and you would like a short video produced to explain the details, let us know and we’ll be happy to consider it. Buying office supplies should be easy, and at Zuma we want to do all we can to take the guess work out of finding what you need for your business. Thanks for helping Zuma do good work! This entry was posted in Office Supplies Shopping Tips and tagged Classification Folders, office supplies, universal classification folders, Zuma, Zuma Office Supply, zumaoffice.com. Bookmark the permalink.